Fold-y flats aren&apos;t a new concept, but they&apos;re hot now, angels-sing saviours when your feet&apos;ve had it with the heels you&apos;ve worn all day. When GAP launched their City Flats ($39.50 per pair) a couple of months ago, folks snapped up the soft leather shoes in their matching drawstring pouches so quickly the display was nearly empty for weeks, despite regular replenishment. Thanks to my friend Liza, who spotted them practically minutes after they hit shelves, I snagged a grey pair to keep in my bag (hey, I do have a pair of grey shoes! ), and a tomato red pair I keep in my makeup kit so I have clean slippers to wear when I go to a bride&apos;s home on her Big Day. I may have to snag yet another pair come October 18, when GAP puts out a super-cute flower ballet slipper ($29.50 per pair), also foldable. Also coming around mid-October are Dr. Scholls for Her Fast Flats ($14.99), which look a lot like the Damn Heels version and come in a little wristlet. Note, however, none of these shoes is meant for all-day wear. The City Flat soles are more substantial than the Damn Heels slippers, and likely the Dr. Scholls, which I haven&apos;t tried, but still they lack the support feet need for treks longer than an emergency few minutes. But for those few minutes after a torturous day in challenging shoes, they&apos;re such. sweet. relief. GAP City Flats are available in Canada at GAP stores only; in the US they&apos;re available via gap.com. Damn Heels are available via damnheels.com. 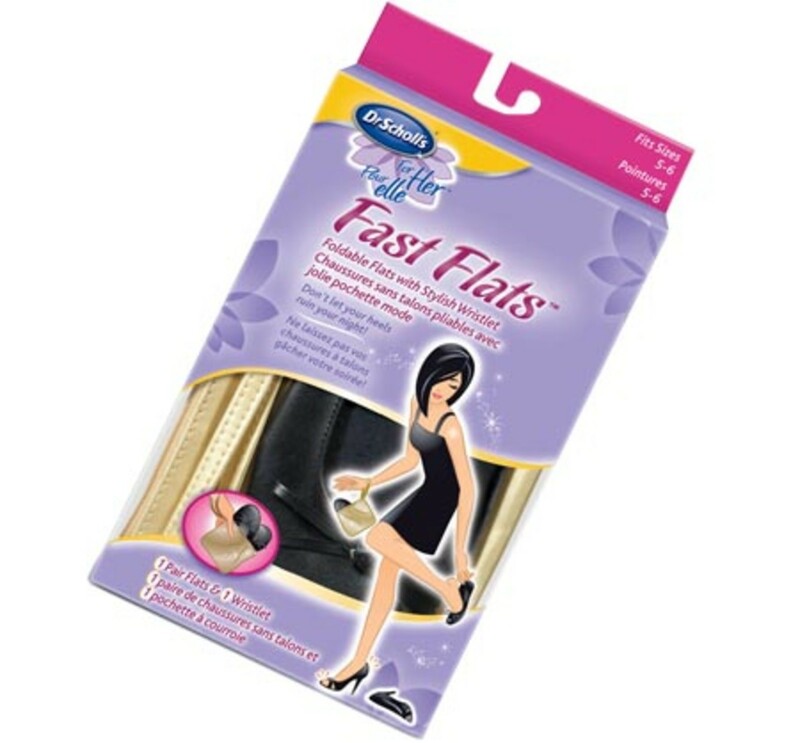 Dr. Scholls for Her Fast Flats will be available at drugstores, supermarkets and big-box retailers.